1) This paper is based on the paper written and presented by Ms. Nsame Nsemiwe at the XXIII FIG Congress in Munich, Germany, 8-13 October 2006. The FIG Council has decided to award the Congress Prize to two papers presented by Ms. Nsemiwe. The other paper is "Negotiating the Interface: Struggles Involved in the Upgrading of Informal Settlements -a Case Study of Nkandabwe in Kitwe, Zambia". Land is the focal point of economic growth and the most valuable asset on earth as it is the source of all human survival. It is a resource that must be properly managed in order to ensure that everyone in a particular society benefits from its use and that uses of land are not environmentally damaging and where possible contribute to the sustainable development and poverty reduction in an economy. While we may have diverse problems related to land all over the world especially in developing countries, secure tenure, access to and ownership of land should be identified as a right of every human being. Women are at the focal point of rural agriculture, development and poverty reduction but the majority of them face serious constraints in access to and control over land. Normally the right to access, ownership and control over land are determined by patriarchal marriages and inheritance systems that are prevalent in many developing nations which favour males unlike their female counterparts in terms of the rights to control and disposal. The role of a surveyor is thus very important in ensuring that people all over the world have an opportunity to access or own land so as to contribute to development and reduce poverty as their profession is closely tied to land. The expertise of surveyors in planning, recording, distributing, management and advice in decision making on land related issues is vital in many economies especially those of developing countries. Surveyors can make a difference in ensuring that every person in the world has access to and can own land, and by so doing they will definitely contribute to the changes going on in the world positively. The paper discusses customary inheritance practices and their impact on distribution of land, access to land, security of tenure and poverty reduction in areas under customary tenure or rural areas. The task of managing land use and the earth’s resources is gaining increasing importance due to the rising world population and economic growth. Land is the basic resource for human survival and development and all human activities such as mining, agriculture, tourism, building take place on land. It also performs basic and fundamental functions that support human and other terrastrial systems such as to produce food, fibre, fuel, water or other biotic materials for human use: provides biological habitats for plants, animals and micro-organisims: regulates the storage and flow of surface and ground water; provides physical space for settlements, industry, recreation and enable movement of animals, plants and people from one area to another. One of the greatest writers on land – Henry George, who may also be referred to as the foremost land economist, appreciated the value of land and once remarked that "...land is the habitation of man, the store-house upon which he must draw for all his needs, the material to which his labor must be applied for the supply of all his desires; for even the products of the sea cannot be taken, the light of the sun enjoyed, or any of the forces of nature utilized, without the use of land or its products. On the land we are born, from it we live, to it we return again- children of the soil as truly as is the blade of grass or the flower of the field. Take away from man all that belongs to land, and he is but a disembodied spirit" (George, 1879, rpt. 1958). Mans life depends on land, thus any fight against poverty must give highest priority to land issues such as its access, distribution, management, administration, ownership and tenure security, especially in developing countries.Due to various traditions, customs and culture especially in Africa, it is a reality that there is inequality between men and women in the control over, access to, ownership and management of land. This is more prevalent in areas under customary tenure some of which may also be referred to as rural areas where women may have less access to land and tenure is not also very secure as compared to men and one of the factors contributing to this is the inheritance practices that are present in some of these areas. The issue of customary inheritance practices related to land under customary or traditional tenure disadvantaging womens access to land and secure tenure has been hotly debated all over the world, but it still exists and is very real, especially in Africa. Knowing that most areas that are under customary tenure are mostly rural areas which in most cases lag behind in development compared to urban areas it is important to find ways to accelerate economic growth. The World Bank (2005a) reveals that both experience and reserch show that for this acceleration to take place women and men need to be helped to become equal partners in development, with an equal voice and equal access to resouces. It indeed is right to say that when we ensure equal land rights for men and women economic opportunities will increase, investment wil be encouraged in land and food production as well as improved family security during economic and social transition and this will lead to better land stewardship (FAO, undated). Steinzor (2003) argues that women’s lack of property and inheritance rights has been increasingly linked to development-related problems faced by countries across the globe, including low levels of education, hunger, and poor health, therefore it is essential to continue discussing these issues until marginal progress is achieved. In addition, the subject of women’s access to land, has been discussed under Commission 7 of the International Federation of Surveyors (FIG), within the general context of land administration. This shows that there is still a need to address this issue and surveyors in today’s world have got an important role to play to ensure that some of the challenges related to land administration and management such as unfair distribution of land, womens lack of access to land and lack of security of tenure under customary tenure are overcome. Poverty is the negative analogue of human development. It may manifest itself in various ways which may include the lack of basic needs such as food which causes hunger, proper health services and education system, shelter or lack of adequate infrastructures. Poverty affects men and women in different ways and this has led to the widespread emergence of phenomenas such as ’ferminization of poverty’. Muylwijk (1995) describes ‘feminization of poverty’ as the process of women losing rights to fertile land, access to labour and other production resources and of the expansion of women’s responsibilities in comparison to those of men. The issue of globalization and the spread of the money economy to the remotest communities such as rural areas, makes women more disadvantaged because land becomes capital. Researchers such as Lee- Smith and Trujillo (1999) have argued that women's lack of equal property rights with men is a major cause of the feminization of poverty. This is definitely true and as we try to reduce poverty it is essential that grass root causes of poverty such as womens lack of access to land are addressed. The World Bank President Mr . James D. Wolfensohn observed that where gender inequality persists, efforts to reduce poverty are undermined and that numerous studies and on-the-ground experiences have shown that promoting equality between men and women helps economies grow faster, accelerates poverty reduction and enhances the dignity and well being of men, women and children (The World Bank, 2005b). When we are fighting to reduce poverty we must ensure that it is coupled with sustainable development, so as to make the efforts continue for a long time. The 1987 Brundtland Report defined sustainable development as development which meets the needs of the present without compromising the ability of future generations to meet their own needs. Sustainable development therefore entails using resources to the maximum and this calls for effectiveness in delivering desired resources. The final edition of the Report on the Bathurst declaration also makes this very clear by stating in its executive summary that without effective access to property, economies are unable to progress and the goal of sustainable development cannot be realised and it lists womens access to land as one of the overall, most serious problems facing the relationship between land and people. Therefore, for sustainable development to take place land must be properly distributed, managed and secure user rights must be present for everyone in a particular society. Land as a resource covers a wide ecological dimension and is a source of wealth for every economy and it is a tool for poverty reduction. Land is generally abundant in supply but desirable land which can be used for cultivation and other income generating ventures is scarce. The heavy reliance on land for development makes sound management of this important resource so as not to compromise the needs of future generations. Suon and Onkalo (2004) define land management as a system of planning and management methods and techniques that aim at integrating ecological with social, economic and legal principles in the management of rural and urban [land] development purposes to meet changing human needs, while simultaneously ensuring long-term productive potential of natural resources and the maintenance of the environment and cultural functions. Land management aims at sustainable use of land as a resource. Sustainability in this term implies that land management should promote sustainable development by preserving the primary environmental resources such as air, soils and water for present and future users. Kariuki (2006) asserts that for women to be effective managers of land, three issues under land need to be addressed. These include land use, land rights and land administration. Land use involves skills and knowledge. Land rights will consider the terms and conditions which individuals and households hold, use and transact land (land tenure). Other issues include land scarcity and conflicts over land. According to the Bathurst Declaration on Land Administration for Sustainable Development issued in October 1999, tenure may be defined as the way in which the rights, restrictions and responsibilities that people have with respect to the land (and property) are held. It is a set of rights a person or organization holds in land, is one of the principal factors in determining the way in which resources are managed and used, and the manner in which the benefits are distributed. Security of tenure for women must be viewed as a key link in the chain from household food production to national food security. Land administration is the “process of determining, recording and disseminating information about ownership, value and use of land when implementing land management policies” (UN/ECE Land Administration Guidelines). It considers the various institutions that deal with land at the local or community level, civil societies and various government and private sector bodies. It aims to manage land in a jurisdiction by providing security of tenure, a suitable environment for the land market and for public land management in general (Bathurst Declaration). The problems with land and women range from tenure disputes, unsuitable land legislation, land administration, land grabbing and invasions. These have led to unequal distribution and insecure land tenure. For women these problems are magnified because of inheritance laws, modern legislation and cultural issues which in many cases bar a woman from owning land outright or without the consent of her father or husband. The dichotomy between ‘who tills the land’ and ‘who holds the user rights’ has thus been a critical issue in sustaining rural land management, especially with the increase in the female-headed households owing to the ravages of HIV/AIDS and urban migration of men in search of employment in urban areas. In most areas under under customary tenure distribution or allocation of land is mainly according to customary or traditional law, purchase or inheritance. This paper will focus on the distribution of land through inheritance. The Women and Law in Southern Africa (1994) define inheritance as an institutional act of apportioning and receiving the property of a deceased person. It is the practice of passing on property, titles, debt and obligations upon the death of an individual and varies from one culture, region, tribe or country. In most of these areas land has assumed the status of a vital asset, necessitating the need for its protection against alienation outside the clan or family, on the assumption that girls marry away from their parental homesteads, they are not entitled to inherit land exclusively, lest they transfer the land outside the clan or family through marriage. The principle of protecting clan land applies to male and female heirs. However, the principle is applied in a discriminatory manner because while male heirs land rights remain intact during their absence, females have no such advantage, especially in the case of widows. Inheritance may be through the bilineal system which is inheritance through either father or mother. Inheritance and succession determined through the mother is known as matrilineal while inheritance and succession which is determined through the male/ father’s lineage is referred to as patrilineal or gavelkind which is the most common inheritance system in Africa (Hilhorst, 2000:186). Some cultures also practice a system of inheritance whereby all property goes to the eldest child (first born) or son and this is known as primogeniture. According to Lee- Smith and Trujillo (1999), work done on women's access and rights to land and housing by UNCHS (Habitat)'s shows that women are disadvantaged in societies where male inheritance customs are strong. Some societies have a system where everything is left to the youngest child while other societies every child is entitled to inherit an equal share. Hilhorst (2000) notes that matrilineal systems have also transformed. She further argues that in societies where polygamy is practiced, the share of family land received by children on their father’s death will often depend on the status of their mother within the marriage. In addition the number of children a wife has will also contribute to the share she will inherit and widows with no children are normally the most vulnerable as they may not even inherit any property or land. Women’s responsibility for reproduction as well as production places them in a disadvantageous position in relation to the new market opportunities. It is women who nature the children, feed the family and provides much of ‘casual’ paid labour, which underpins commodity production for the market. It’s also women, actually, who interact most closely with the natural environment: collecting the fuel wood, carrying the household’ s water long distances, tendering the vegetable garden. Women therefore bear the brunt of environmental degradation, through their proximity and dependence upon the environment, while also being held responsible for this decline. Unable to reverse the erosion of resources to which the household access, women are placed in the impossible positions of acting as guardians of an environment which is as undervalued and exploited as their own labour. Due to relationship with the products of uncultivated land in traditional management systems, women have lost access to these resources as land is alienated for other uses in modern economies. Secure land rights foster sustainable land management and are believed to have a positive impact on the reduction of poverty, as women will firstly, try and find ways in which to preserve and regenerate their land thus providing sustainable farming practices. In other words with secure tenure women can invest in land rather than destroy the land’s productive potential. Secondly, women can plan quickly to adjust resource allocation decisions under changing climatic or economic conditions. Thirdly, women can rely on the productive results of their labour. Lastly, women will be empowered in decision making since they can decide what crops to grow, what techniques to use, what to consume and what to sell. The lack of access to land and an insecure tenure leaves women with no productive or non productive resources that may be required as means of survival and this will definitely weaken the socio-economic status of women. Zambia’s Poverty Reduction Paper (2004) notes that there are benefits resulting from women’s access to land in terms of family and food security. Food security in this context is the access by all people, at all times, to enough food for an active and healthy life, therefore ensuring poverty reduction. The HIV/AIDS epidemic is a major challenge facing many countries in sub-Saharan Africa where according to a UNAIDS Report on the Global AIDS Epidemic (2004) 75 percent of people of ages 15 to 24 with HIV/AIDS are female.Within these countries, AIDS is becoming a greater threat in rural areas than in cities. The Zambian poverty reduction paper (2004) states that “since the first diagnosed case in Zambia in 1984, HIV/ AIDS has become increasingly widespread with an estimated adult prevalence of 14 per cent in rural areas and 28 per cent in urban areas in the 15 – 49 year old age group.” The report further notes that although the epidemic is showing signs of stabilization in urban areas, the rates continue to rise in some rural areas. Studies by Women and Law in Southern Africa confirm that the situation of women in Zambia poses serious difficulties and challenges especially when the gender dimension and the socially constructed roles of men and women are considered. While both men and women are affected by HIV/AIDS, it is important to recognize that this occurs in different ways for men and women, because men and women play different roles, have different needs and face different constraints in responding to the epidemic. Due to high death rates caused by the HIV/AIDS related illnesses, many women are being left without land or property which is an essential resource for their livelihoods especially due to the customary inheritance practices in most rural areas. In the past widows were regarded sympathetically and were allowed to remain in their husbands villages even when they were not inherited but due the change of societal values, economic hardships and devastating effects of HIV/AIDS family ties have loosened. the right to occupy and use land was previously passed on to children of the deceased especially when the widow was kept within the family of her deceased husband through widow inheritance. Men are reluctant to inherit widows and widows are reluctant to be inherited as the late husbands family fear being infected with the disease after inheriting the widow and also fear the process of taking care of her in the case that she also gets sick. This leads to widows being dispossessed of land by being forced to leave their husbands villages because the rightful person to inherit the deceased’s use and occupation of land is the nephew of the deceased person (Macmillan, 2002). Women also experience stigmatization and mistreatment and in some cases there is a stigma that encourages the view that those who are HIV positive will not be able to properly use the land and therefore they do not need it. The sale of land by land holders at distress prices in order to look after those who are sick is also common. Kariuki (2006) suggests that there is growing evidence to suggest that where women’s property and inheritance rights are upheld, women acting as heads and/or primary caregivers of HIV/AIDS-affected households are better able to mitigate the negative economic and social consequences of AIDS. She further asserts that the denial of property and inheritance rights drastically reduces the capacity for households to mitigate the consequences should a member be infected with HIV. Access to resources such as land by women will enable women fight the socio economic impacts of HIV/AIDS and Kangwa (2005) seems to suggest a similar notion when he argues that because poverty and HIV/ AIDS have the greatest impact on women, all initiatives must priotise the importance of women’s rights to fair and equal treatment, as well as their specific needs and challenges. Zambia is a subtropical country located in the middle of Southern Africa and is administratively divided into nine provinces which, in turn, are divided into seventy-two districts. There are basically two types of tenure present in this nation, namely customary and state. Customary land is that held on the basis of tribe, residence or community of interest. Customary tenure which is mostly in rural areas is legally recognized and accounts for more than 90 per cent of the land in Zambia. The remaining small portion of land is state land which consists mainly of land in urban areas and is not in the jurisdiction of traditional leaders. According to the Land Act of 1995 part 1 Sec 3.1 all land is vested in the president. The traditional leaders such as chiefs and headmen just act as custodians of the land although there is no doubt they have a regulatory role over the acquisition of land. According to the Republic of Zambia, 2004: Poverty Reduction Strategy Paper poverty is most prevalent in the rural areas where most livelihoods are agriculture-based. The paper further asserts that Zambia is abundantly endowed with resources that are required to stimulate agricultural and rural development, in general, and poverty reduction in particular. Table 1 shows the reality of poverty in rural and urban areas in Zambia between 1991-1998. Table 1: The Evolution of Poverty in Zambia 1990-1996. Women constitute 65 per cent of the rural labour force working on this land contributing approximately 60 per cent of the total rural products. It is, however, sad to know that women’s access to, control over and management of land that sustains their livelihood is out of their hands. The Zambia Land Alliance (2005) note that during their consultation process with various communities in the country, they observed that women did not have access to land as much as the men despite traditional land being free and that the tendency to dispossess and remove widows and orphans from family land upon the death of a husband/father, was widespread. It is evident that inheritance problems are very evident today not just in the past. A customary marriage is a marriage that is conducted according to the relevant Zambian customary law of the two parties. In the Zambian context, such a marriage is usually viewed as a union between two families. There are a number of requirements and procedures to be followed in the traditional marriage. Firstly a number of transactions take place. These begin with the approaching of the girl's family with a token symbol or payment called Nsalamu (Bemba) or vulamulomo (Chewa - literally 'opening the mouth'). The negotiations go back and forth depending on the traditions and customs of the parties and culminate in the concluding of the marriage negotiations. A customary marriage can be registered by the local court and by the rural councils. A customary marriage is potentially polygamous, that is, during such a marriage, there is no legal impediment to a man taking another woman as his wife. Polygamous marriages are very common in Zambia and under customary tenure it is normally unheard of for a married woman to acquire land for herself. In cases where a man has more than one wife he apportions a field to each wife and her children to plant, weed and harvest. The problem mostly comes in when the husband dies as land and property are allocated according to status of their mother within the marriage. Polygamous marriages therefore, contribute a lot to inequality especially in terms of rights to property and inheritance. Customary marriages may also be virilocal or uxorilocal. Virilocal marriages occur when a wife moves to her husbands homestead or village after marriage, while uxorilocal occur when the husband or man moves to his wife’s homestead or village after marriage. This also has an influence on inheritance of land or property in a particular ethnic group incase of the death of either the husband or wife. The many forms that marriage can take, the basis (or lack) of marriage contracts, the practice of wife inheritance, the growing prevalence of cohabitation, norms dictating dowry, and the ongoing practice of polygamy strongly influence both customary and legal partnerships and outcomes related to property and inheritance (Steinzor, 2003). In a newspaper article dated 10th May, 2006 Mushota stated that traditionally, it was believed that empowering a woman would lead to marriages breaking and that land is wealth and once women have access to land they will become self-reliant and won’t have to go through hard marriage just because of dependency. In the same article Zijena said that, “traditionally, most chiefs don’t give land to women without the husband’s consent for fear of the woman becoming empowered and subsequently losing respect for the husband,” She added that widows in most cases were now being evicted from the land and that, in villages, women especially widows are even required to vacate the land and leave it for the husband’s brothers unless someone from the family marries her but since that custom is no more, women are left with no land. Widows normally accept loss of property because they are scared of being bewitched, some do not know their rights especially towards property, while others find it is difficult to challenge in-laws. Widows normally return to their natal villages where they start cultivating land that belongs to their matrilineal male relatives. Women who do remain in their husbands villages labour in their in-laws’ land where they work on their mercy and may be chased at any moment. Some of the customs related to access or ownership of land include widow inheritance which is a practice where the widow becomes the wife of the successor of the deceased. According to Machina (2004), thirty per cent of the rural households are headed by women and are the poorest as they tend to have less fertile, small plots of land than male-headed households. Most female headed households are headed by widows and grandmothers characterized by the ownership of the few productive assets and less access to land for agricultural production. Short-term responses such as selling productive assets and removing children from school worsen household poverty in the long term and contribute to the feminization of poverty in Zambia. A good example of an ethnic group that follows patrilocal systems of inheritance is the Ngoni of Eastern Province. On a man’s death inheritance is essentially on the principle of primogeniture (inheritance is by the first born). This sort of inheritance has a special meaning to this ethnic group as they have a social structure that is not only patrilineal but one in which polygamy is common. According to Mvunga the context of primogeniture amongst the Ngoni means the following: Firstly, it may mean inheritance of a man’s estate by his eldest son, where all his children are born of one and the same wife. Secondly, it may mean inheritance by the eldest son of the senior house, where children are born of various wives in a polygamous marriage. Lastly, it may mean inheritance by the eldest male person who by virtue of belonging to a class of paternal relatives can be described as the deceased’s nearest blood relative. Due to the fact that polygamy is considered, inheritance follows what Mvunga calls ‘principle of inheritance by house.’ House in this context refers to the order of wives within a particular marriage. Thus seniority of a house is determined by the sequence in time in which different wives get married to the same husband. This means that the first wife will create the senior house while the other wives will be of the junior house. It is the eldest son of the senior home and not the eldest son of the father (assuming there is such a one in other houses), who inherits the father’s estate. At times a son from a junior house may be the heir to a father’s estate and this only occurs if there is no son in the senior house, then an heir will be sought in the next senior house which has a son. Though it is worth noting that in very rear circumstances when the eldest son of a senior house is failing, the next eldest daughter of the same house inherits the father’s estates. Article 23 of the republican constitution allows for customary law and practices to exist side by side with statutory law. Zambia’s dual legal system means that people are governed by different and often contradictory systems of law. General Law depends on English law, with many statutes new and old being replicas of English rules of registration. Women’s access to, control over and ownership of land are above all constrained by customary law and by attitudes and practices, which reflect the subordinate position under customary law, (Keller, 2000). Customary law is not codified but comprises of unwritten social rules that are mainly passed on from one generation to another. Customary law is based on the particular ideologies operating on the premise that men are biologically superior to women and varies from one ethnic group to another. This logic has also permeated all instructions of socialization both tradition and constitution. Although a lot of policies and laws have been put in place over the years concerning equality in relation to land issues they receive a blind eye especially in rural areas where the land is mostly under customary tenure. Ossko (2006) asserts that in many countries besides written law, customary, informal laws are parallel existing which are very important for a lot of people. He further remarks that sustainable land administration has to take unwritten laws into consideration if it wants to serve the entire society. This is very true especially in most African countries. The 2000 Land Policy states that ’while current laws do not discriminate against women; women still lack security of tenure to land in comparison with their male counterparts.’ The policy puts the blame on customary and traditional practices. With this in mind the policy states that ‘thirty per cent of the land, which is to be demarcated and allocated, is to be set aside for women and other vulnerable groups.’ When a person dies without leaving a will the 1989 Interstate Succession Act gives a provision for the spouse to inherit twenty percent of the deceased estate. The problem is that this law and many other laws that favour womens ownership of land are not applicable in most areas that are under customary tenure especially the remotest parts of the country where people have never even heard of such laws. The "inheritance clause", which was birthed by the Super Coalition in Beijing was aggresively debated and became a major item in the Platform For Action. The Beijing conference also noted that environmental degradation that affects all human lives often has a more direct impact on women, as their health and their livelihood are threatened by pollution and toxic wastes, large-scale deforestation, desertification, drought and depletion of the soil and of coastal and marine resources, with a rising incidence of environmentally related health problems and even death reported among women and girls. The Platfoam also alluded to the fact that the most affected are rural and indigenous women, whose livelihood and daily subsistence depends directly on sustainable ecosystems. The documents mentioned and many others that individual countries such as Zambia are affiliated to must be properly analyzed to find ways in which they can be implemented so as to bring about equality in the access to land between men and women under customary tenure or in rural areas. The gap between who gets the land and who tills the land under customary tenure is still very wide as men and not women make most decisions concerning customary inheritance or allocation of land and it is very difficult for women to own their own land. In view of the foregoing, the following recommendations may be seen as a tool under customary tenure to enhance women’s secure tenure and access to of land. Land management in most areas under customary tenure or rural areas in Africa is handicapped by customary practices such as inheritance that are embedded in tradition, customs, family heads and lineage/clan leaders who determine who gets the land. The improvement of the management of land under customary tenure will surely have a direct effects on the access to, distribution of land and promote secure user rights which will definitely be an important step in ensuring food security and poverty reduction in nations where women’s lack of access to land and security of tenure is prevalent. If land management or land administration systems are improved and women have better access to land through practical efforts, then surveyors will really be seen to contribute positively to the change go in the world today. Food and Agriculture Organisation of the UN, Land Rights: A Gender Perspective, available on www.baobabconnections.org, accessed on 27th May, 2006. 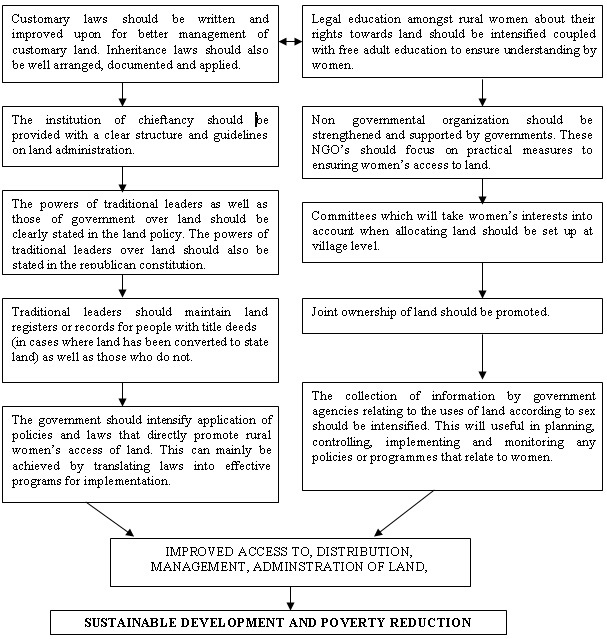 Lee-Smith D. and Trujillo C. 1999, The situation of women and land - problems identified, CSD NGO Women's Caucus, Position Papers: Land Resources, Land Management. Government Republic of Zambia (1995), The Lands Act, 1995, Lusaka: Government Printers. Government Republic of Zambia (1989), The Interstate Act of 1995, Lusaka: Government Printers. Government Republic of Zambia (2000), The Land Policy, 2000, Lusaka: Government Printers. Keller B, (2000), Women’s access to land in Zambia, Prepared for International Federation of Surveyors (FIG), Commission 7( Cadastre and Land Management). Machina H, (2002), “Women’s Land Rights in Zambia: Policy Provisions, Legal Framework and Constraints” Zambia Land Alliance, Presented at the Regional Conference on Women’s Land Rights, held in Harare, Zimbabwe, from 26-30 May 2002. MacMillan J, (2002), Women and Law in Southern Africa Research and Educational Trust-Zambia, Presentation on HIV/AIDS and the Law: Challenges for Women at FAO/SARPN from 24th-25th June 2002. Muylwijk J, (1995), Gender Issues in Agricultural Research and Extension, Autonomy and Intergration, In R.K Samanta (ed), Women In Agriculture: Perspective, Issues and Experience, M D Publications PVT LTD, M D House, 11 Darya Ganj, New Delhi-110 002. Mvunga P.M, (1x 7982), Land Law and Policy in Zambia, Maimbo Press, P.O Box 779, Gweru, Zimbabwe. Redclift M, 1991, Sustainable Development: Exploring the contradictions, Routledge II, New Fetterlane, pp 65 London EC4P 4EE. Republic of Zambia (2000), The Poverty Reduction Strategy Paper 2002-2004, Lusaka, Zambia. UNAIDS (Joint United Nations Programme on HIV/AIDS), 2004, 2004 Report on the Global AIDS Epidemic, Geneva. UN/ECE, (1996), Land Administration Guidelines, UN publication, Geneva, 1996. Zambia Land Alliance,(2005), Booklet on communities views on the Land Policy: Draft Land Policy Review Consultation Process in Zambia. Ms. Nsemiwe Nsama is currently pursuing a Bachelor of Science Degree in Real Estate at the Copperbelt University in Zambia. She worked as an intern at Knight Frank Zambia (Feb – April 2006) and at the Ministry of Lands (Jan –March 2005). She also worked for Standard Chartered Bank (June 2001 – March 2003) and at Fountain of Hope: An NGO dealing with the welfare of street children, orphans and other vulnerable children (1999-2001). She is a member of the Commonwealth Association of Surveying and Land Economy and also of the African Real Estate Society. She is currently serving as the vice president of The Copperbelt University Real Estate Students Association.